I was stuck. I wince at the imaginary online screaming match. This is no-go area: pointing out the white elephant in the room and something that is logically totally obvious but abuses just about every sensitive nerve of cat lovers. (& from my previous project Association of Feline Association I appreciate how dedicated cat lovers are to their feline companions). Cat lovers vs. Bird lovers…. There were again, death threats… but this time, it was on a different spectrum. I was quite ready to blank out this round of cat-related drama but realised that this is the whole debate about fringes and future and activism. This wasn’t an animal lover vs. zoo keeper, or restaurateur. It was a polarised battle against two different human-nature interactions. On one side of the argument is ‘nature’ (superiority at having been there first before human-involvement) and the other is deeply personal, human habit of adopting animals into our homes. The clash comes when the urge to protect the endangered native bird species comes at the cost of invading family structures where the cat is a member. James Serpell offered me a good starter into the world of anthrozoology from a relatively linear explanation of the stereotypical human-dog relationship with a farming/hunting/sledging history to the relatively chaotic desire-filled case studies of dog-theorapy stories in The Domestic Dog: it’s evolution, behaviours and interactions with people. Cats hunting abilities that used to be so useful at keeping mice bay in Europe, are now under the focus of the destruction of flightless New Zealand bird species. 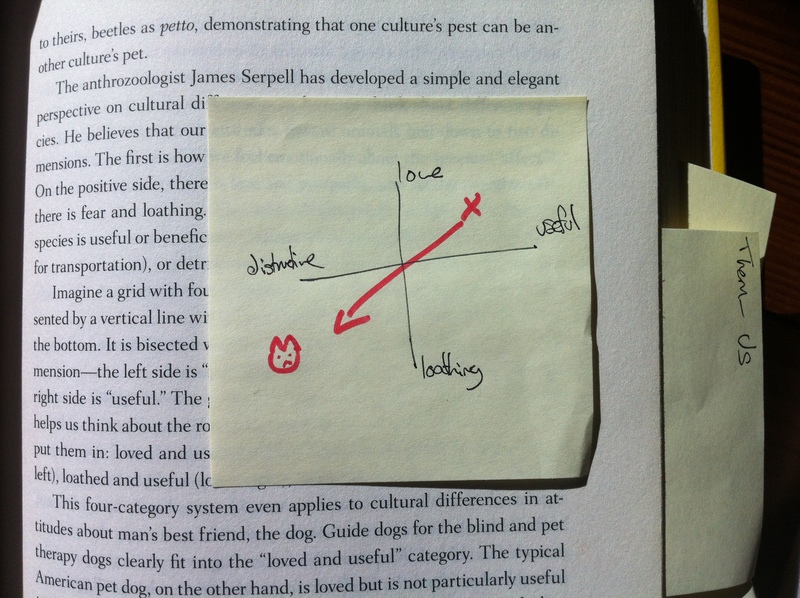 If vertical axis is emotional love-hate spectrum and the horizontal axis is utilitarian, it might be assumed that the role of that cat in New Zealand has slid from the area between love and useful, into a battle of love and destructive. Right? I disagree. I’m no anthrozoologist but I do know that our aspirations and sentiments towards technology reaches far, far beyond function alone. Would we have loved Lassie so much if it (she) wasn’t such a helpful dog? Hal Herzog would argue that pet-keeping is purely memetic, a brain-induced evolutionary ‘parasite’ to such our love and devotion to further the pet evolutionary development rather than our own. Pet-keeping is culture.! In fact nowadays when we describe the notion of memes we think – internet memes – e.g. LOLCats (everyone should read Kate Miltner’s thorough study of LOLSpeak). The fact that people use LOLCats to abstract complex ideas into a “meme” to disseminate quickly is evidence of how successful human-animal relationships are actually about human relationships. FYI, the feature image for this post is by Misty. In fact, I’m not sure if the question of cats could ever be answered without the cat people in mind. We need to judge the debate not in abstract rules of the function of cats to humans, but in terms of cat people’s contribution. I’ve been saving this for years but now I’m trembling with seriously belated excitement have an excuse to serenade Ethan Zuckerman’s Cute Cat Theory of Digital Activism”. “Most Tunisians don’t identify as activists and might not be engaged with politics. But, like Americans and Europeans, they’re interested in seeing cute cats being adorable online. When the government blocks DailyMotion, it impacts a much wider swath of Tunisians than those who are politically active. Cute cats are collateral damage when governments block sites. And even those who could care less about presidential shenanigans are made aware that their government fears online speech so much that they’re willing to censor the millions of banal videos on DailyMotion to block a few political ones. Like Zuckerman’s explanation in the importance of banality, fight between bird people and cat people in New Zealand might seem small, but really is a debate about how we progress in the face of clashes between cultures and scientific logic. Perhaps the reasons that we have these seemingly inconsistent treatments and relationships and obsessions with the same and different animals is that these conditions allow cultural varieties. Different Human-Animal relationships will hopefully broaden our possibilities. We need varieties in order to adapt to changes. Previous PostActivism vs… Death threats?